Very friendly and accommodating check in staff, as always. Great views of La Rochelle and easy to get to town and attractions. Helpful staff. Rooms are small but perfectly formed, lack of wardrobe space so only suitable for a short stay. The hotel was easy to find, we parked our car then returned later to get our room. The room was very pleasant with a comfortable bed. We had dinner followed by a good night's sleep. Breakfast was good with a varied choice of foods. The staff were all very nice. All over it is pleasant and a good service. After some days, we would appreciate a change in the menu of the restaurant. This is my sixth visit to Mercure Hotel Vieux Port and due to the cooler weather I took advantage of dinners at the Oceanide Restaurant. Every meal I had was excellent and at a very reasonable price. The experience was good. We got the room we in the floor and location we wanted, though no upgrade for a platinum member. The basic room was better than last time around with excellent bed, but breakfast was maybe a bit lagging, probably due to quiet period. However, it was better than what we had in another Mercure hotel in Paris after visiting yours.. I visit La Rochelle often on business, and I always stay at Hotel Mercure Vieux Port Sud. The staff is very friendly and helpful. The hotel restaurant has very delicious dinners at a reasonable price. The rooms are perfectly sized for a business trip. Great hotel near to the Vieux Port near to all attractions. We stayed here for 5 nights over Xmas. Compact room with good views of the port and towers. Great buffet breakfast. Friendly staff. Lovely walks around the harbour, along the seafront, in the old town- all on level ground. La Rochelle is well worth a visit. Loads to do and see. Excellent market, museums, aquarium and historic towers. Lovely beach, great shops, bars and restaurants. Dear JandP-109, Thank you so much for your comment. We are very pleased to read that you have enjoyed our hotel and our lovely town. Hope to see you soon in Mercure La Rochelle. Kind regards, Elisabeth. We have always used La Rochelle as a stopover between the UK and Spain where we live. The MERCURE is perfectly positioned within the Port and historic Old Town and has a massive Secure Parking Area. Breakfast is excellent and the Port View Rooms very nice. Dear Christopher Chamberlain, Thank you so much for yuor kind message. Regarding the offered drink, it's the Accor policy to offer a drink only for the membership, we're sorry about that. 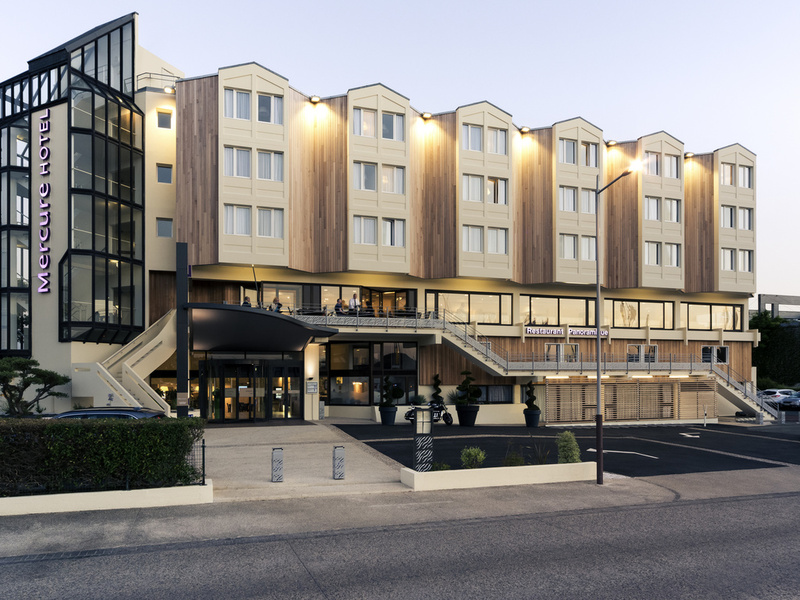 We hope to welcome you for another stay in Mercure La Rochelle. Kind regards, Elisabeth. Excellent - and very pleased to have stayed in your Hotel. Another warm welcome at this hotel in the centre of La Rochelle. Very conveniently situated within walking distance of the old port with its fascinating small streets and many popular restaurants. Large car park with free parking. Rooms are quite small but on the whole comfortable - but beware of the wooden ledge just above your head when you are in bed! Copious self-service breakfast in a bright and airy breakfast room with an excellent view over the old port. Courteous and friendly staff. I will return!! Dear Stephen, It's always a real pleasure for us to welcome you ! Hope to see you soon. Kind regards, Elisabeth. Warm welcome and easy (free!) parking. Brightly lit reception area. Privilege room seemed quite small but was well equipped and had a good view over the port. It was very cold!! As was much of the hotel. Did mention this to reception who told us how to operate the air conditioning better. This did not seem to make much difference!! Breakfast was copious with, again, a good view of the harbour. Scrambled eggs were cold!!!!!!!!!!!!!!!!!!! However, overall, another satisfactory experience at this hotel to which I will return. Good hotel in la Rochelle. Excellent central location with ample secure parking. Vieux port view from room was lovely. Room chosen was smaller than I expected, but still had all facilities and was comfortable.As we were out most of the time it didnt matter. Staff friendly and efficient. Breakfast very good, always appreciate the local specialities as well. We ate in the hotel each of the four nights stay- 2 nights we had excellent meals, 2 night ok/average- again our choices. Definitely recommend hotel.